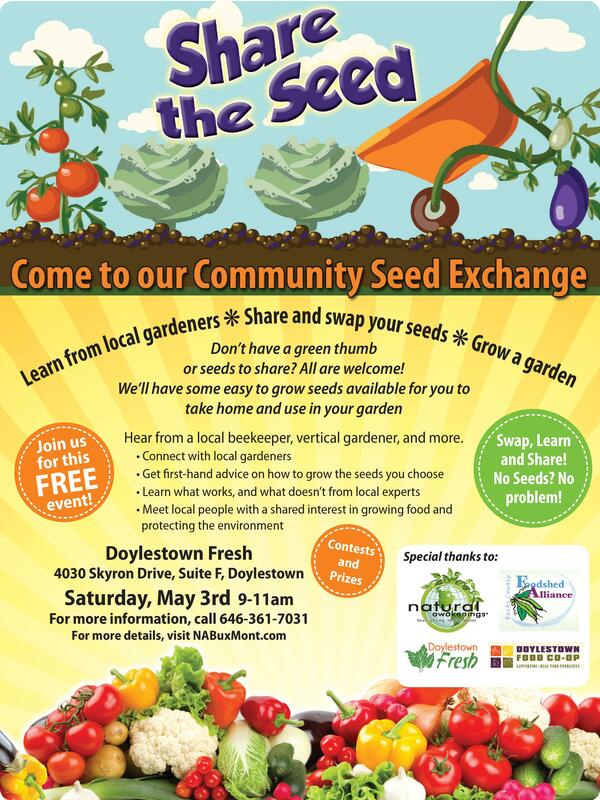 Thank you for your interest in our first Community Seed Swap on Saturday, May 3, 9-11am at Doylestown Fresh! According to Vegetable Gardening in the Northeast by Marie Iannotti, May is a great month to plant sweet potatoes, beans, broccoli raab, corn, cucumbers, lettuce, melon, okra, pumpkin, rutabaga, and squash. Bring your well-labeled seeds with growing instructions as well as empty containers to bring home your newly acquired seeds. Informal, easy-going get-together. Swap, Learn and Share! Contests and prizes. 9:15-9:40 How does your garden grow? 10:45-11:00 Bees, what’s the Buzz about? 1. seed you’ve collected from hybrid plants, as it won’t grow true to type. 2. If the seeds are older than 2-4 years old, they may not be viable. Some seeds (onions, leeks, parsnips, celery, spinach, salsify) are only good for a year unless stored especially well. 3. And of course, please do not bring any GMO seed. No seed? No problem! Come, learn, and go home with some seeds to sow. – Listen to workshops on bee keeping, composting, general gardening and more! Thanks and we can’t wait to share our seeds with you! This entry was posted in DEPARTMENTS, Letter from Publisher and tagged BucksCounty, garden seeds, gardening, Marie Iannotti, SeedSwap, sustainability by Healthy Living Bucks and Montgomery Counties. Bookmark the permalink.